AN ANGLER’S GREATEST teacher is ultimately himself or herself. When you reach a level where you recognize your own mistakes, and improvise your own opportunities, that’s when you’re playing your best, and catching more fish. You can read books and articles, hire guides, take classes (all of which will no doubt help shorten the learning curve), but in the end, it’s the voice in your head that will matter most. So how do you move toward that level? You challenge your brain. Go off script. Improvise your own tunes. 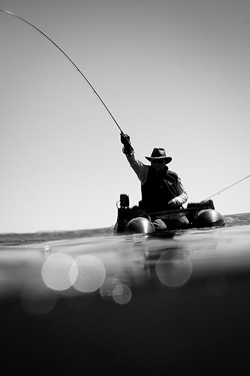 Fly fishing really comes down to the art of problem solving. “How am I going to trick this creature and its instinct into eating an artificial fly?” “Where should I cast?” “If the fish eats, and he’s big, what then?” All problems (fun ones) worth solving. Reading an instruction manual—or watching a strike indicator ride through the same run, over and over—isn’t really cognitive problem solving, is it? Sometimes, when you intentionally make problems tougher (and solve them), those little routine challenges on the river become easier to overcome, and training for them is like doing calisthenics for the angling brain. So here is my favorite challenge, and August is the perfect time to do this: Dedicate a day to fishing one pattern only (you can bring spares—there’s no penalty for breaking off). Make that pattern a Muddler Minnow. Fish it all day, and see how many trout you catch. I’m not going to spoil the lesson by doling out stuffy advice on how to fish Muddler Minnows differently, but I will give you three hints. 1) Muddler Minnows are so named because they can imitate baitfish—they’re a great streamer pattern, especially in rivers where sculpins swim. 2) August is a great time to try this exercise because Muddlers look a helluva lot like a certain insect trout like to eat in this season. 3) That insect isn’t a great swimmer, and isn’t even a particularly good floater. Now go have fun. When you fish your Muddler in what way, and how you present it to trout, is entirely up to you. You might not want to spend a valuable day on the river as a “training exercise.” But believe me, developing your own improvisational skills will pay dividends. You’ll find that there really are no definite rules or answers. Only hunches and intuitions. And yours are the only ones that ultimately matter.